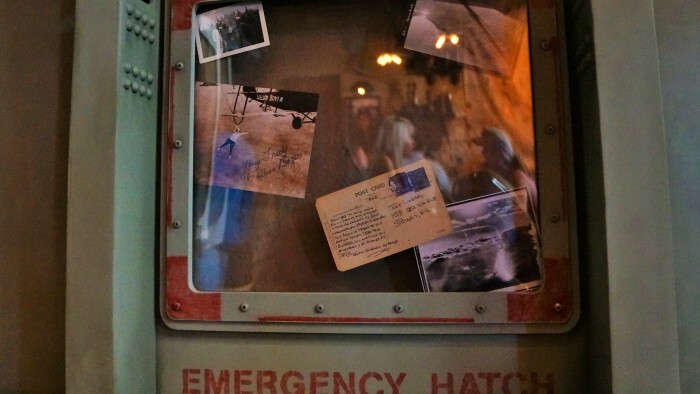 When the news of Jock Lindsey’s Hangar Bar first hit the newsreels, the natives became restless. The general consensus was that the idea of a themed bar based on a very obscure character from the Indiana Jones films just wouldn’t cut it. The hangar doors have now opened. The time to explore and probe this unique establishment has come. 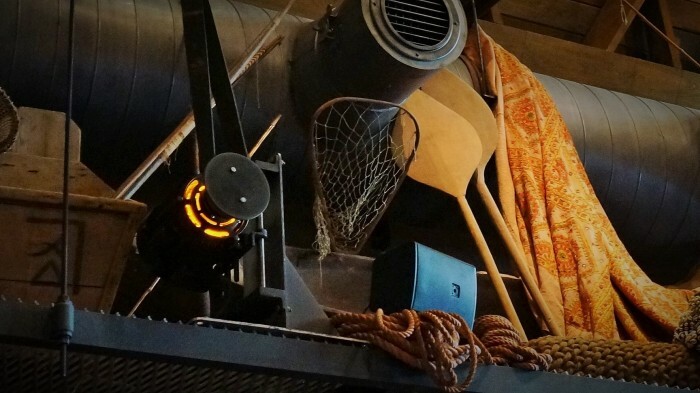 I braved the crowds and operational hiccups of opening day to get a first impression of the Hangar Bar (you’re welcome). Let’s take a look at this highly anticipated establishment. 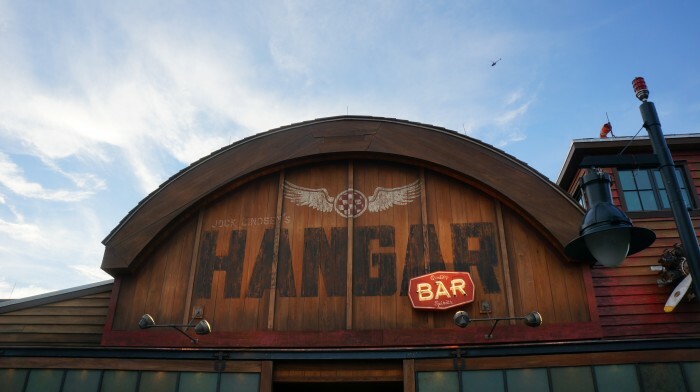 Jock Lindsey’s Hangar Bar is located on hallowed ground. 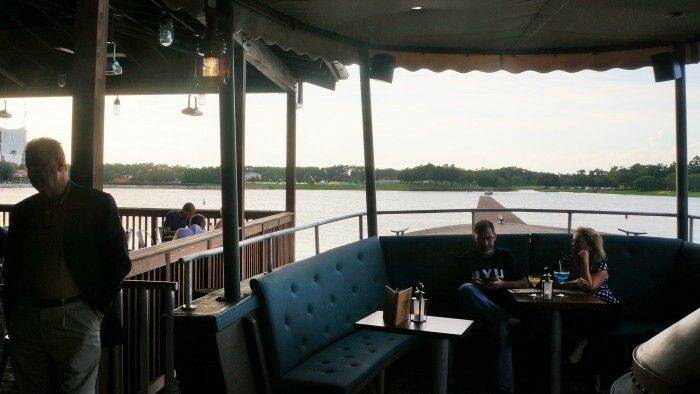 Once the site of countless epic nights of entertainment at Pleasure Island, this re-born section of Disney Springs is now known as The Landing. 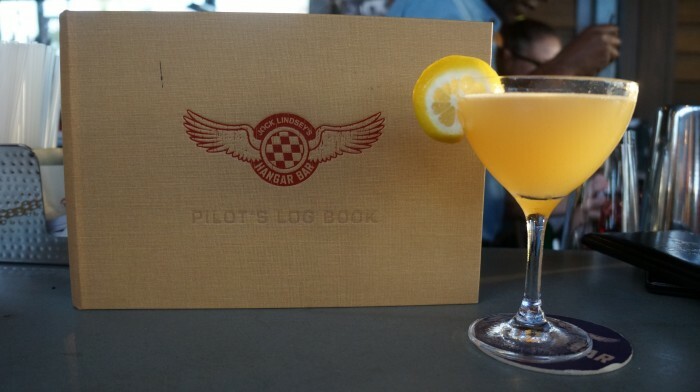 The Hangar Bar is ideally nestled along the shores of the glistening lake. With Paradiso 37 and The BOATHOUSE as neighbors, this artfully aged hangar building with its rigged, scrapped metal sign stands out in a good way. When I arrived on opening day there were two Cast Members and one manager, each with an iPad in their hands, smiling, willing, and ready to assist approaching guests. Two were staged in front of the hangar doors, while one waited just inside the double doors. I would assume that after the first few days of the opening frenzy staffing would be reduced to one or two cast members on greeting duty. After letting the Cast Member know my party size she explained that it would be about 45 minutes to wait (this was at 6:00 PM). She took my full name and asked if I’d like to provide my cell phone number in order to be alerted when the table was ready. I did so gladly. She also asked if I had a preference for sitting inside or out, since it was opening day I really has no preference. My party was later informed, near the end of our wait, that we were welcome to order any drinks from either bar (inside or outside) to enjoy while waiting. 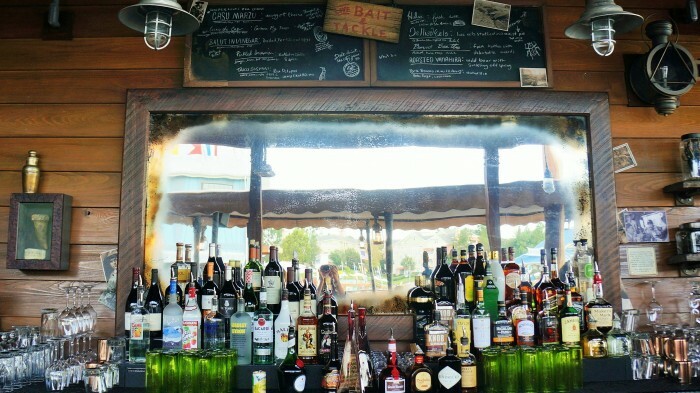 We decided to go to the outside bar to order some “waiting drinks.” Since it was such a busy day, and the Cast Members were understandably still getting acclimated, it took a while to get our drinks and pay for them. While attempting to pay the bill my phone buzzed at the 53 minute mark. 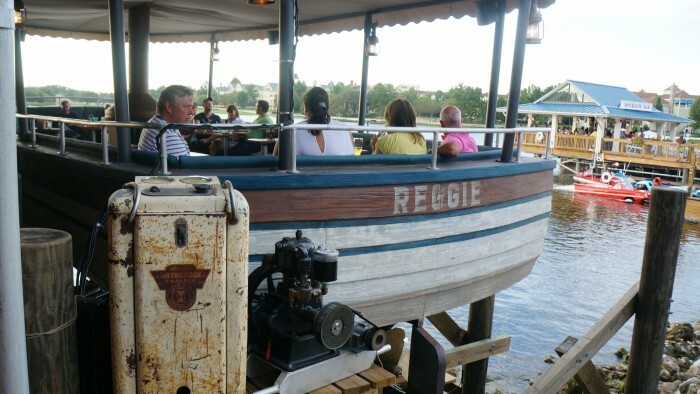 After a few minutes we rushed over to the host stand, gave my full name, and quite humorously were escorted back outside to sit aboard the Reggie jungle boat. 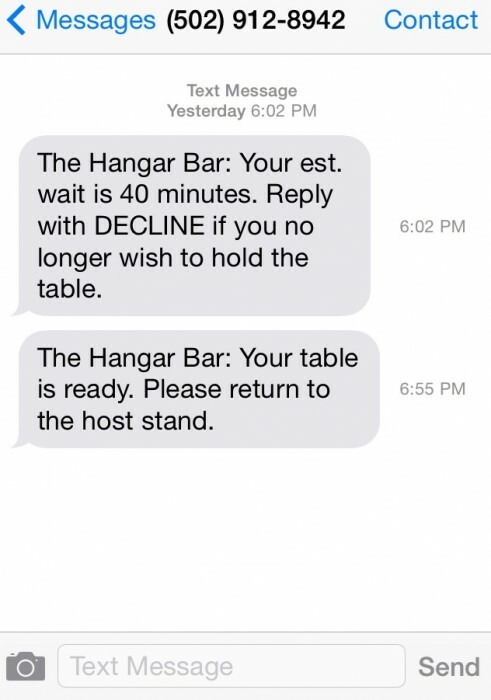 Note: at time of publication seating at either bar still requires a check in with the host, and thus a wait. You can, however, order drinks and stand in the bar area or front waiting area. 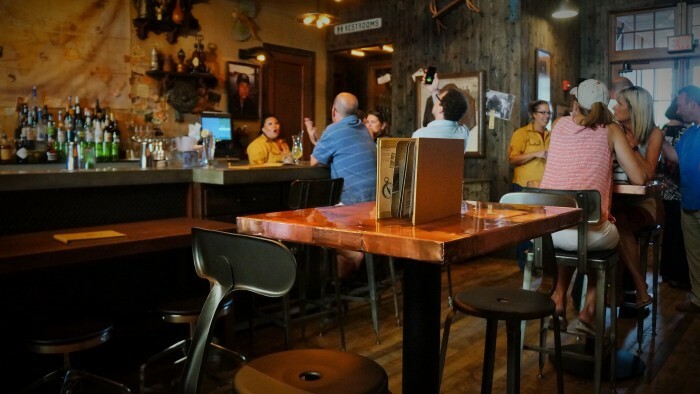 However, guests who have visited later in the evening and slower times have reported being able to sit at either bar without getting on wait list. 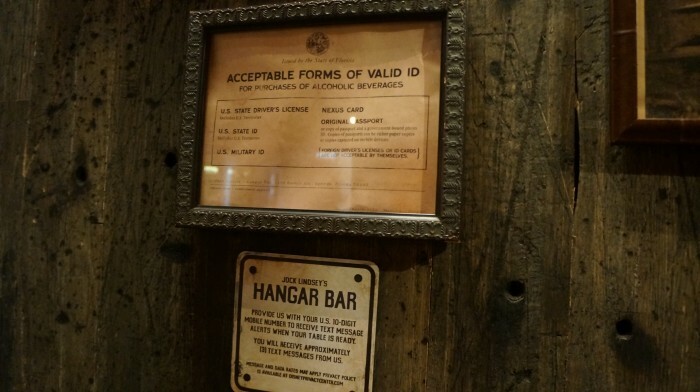 Many have expressed concerns that Jock Lindsey’s Hangar Bar would end up being a logistical challenge in the same way that Trader Sam’s Grog Grotto often is, due to high demand. 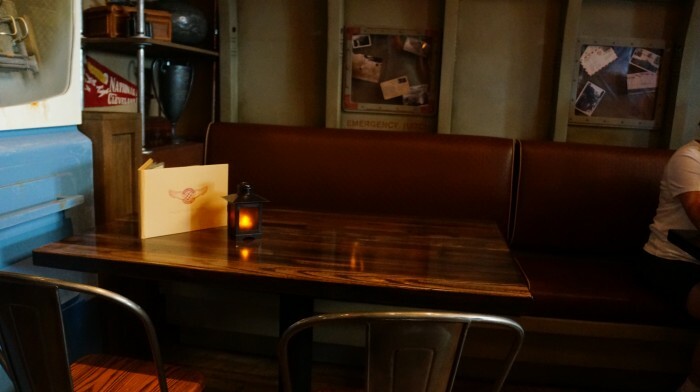 The great news is the Hangar Bar has plenty of seating and space. 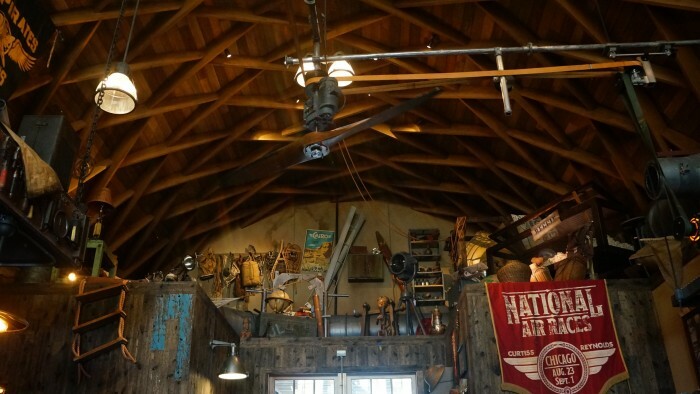 The interior is rectangular and very much resembles the sprawling expanse of an airplane hangar. The inside space essentially has four areas: An attractive bar lines the right-hand side of the space. In the center, high-top tables and chairs are ideal for couples and parties of three or four. Along the left side, booth style seating is built into an airplane fuselage. 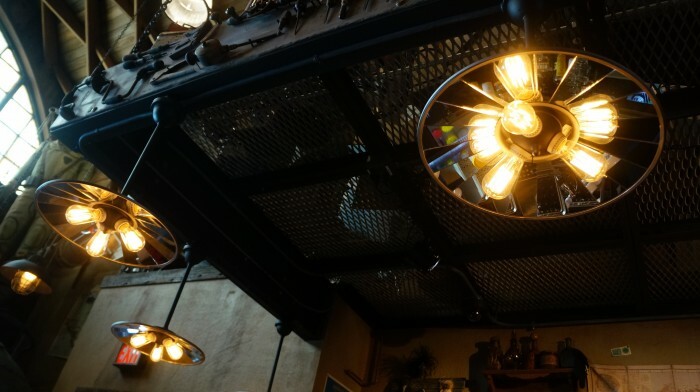 Finally the two back corners are home to two seating areas that are sure to be the most sought after places to be seen: the left corner is the library section, a great place for gathering with a group with tons of details and eccentric lighting fixtures. (Keep an eye out for the infamous golden idol from Raiders of the Lost Ark). 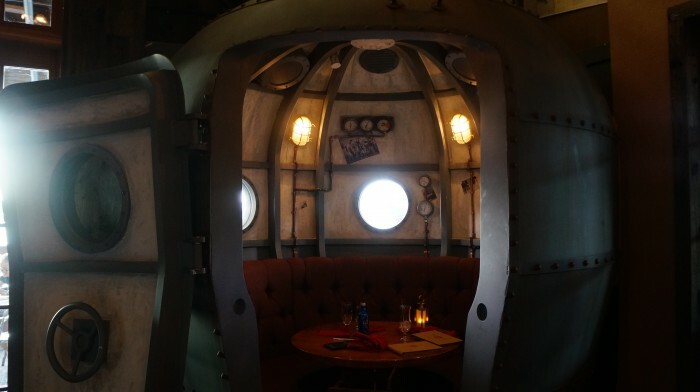 The right corner is quite the eye-catcher with a large, rotund diving bell where parties of 5-7 can sit in a semi-circle booth. All this space is just the inside! Outside we are treated to not just a back porch, but a side porch, and a boat! The back porch contains a good amount of seating. And fear not, there is still plenty of theming and decorations adorning the outside walls. 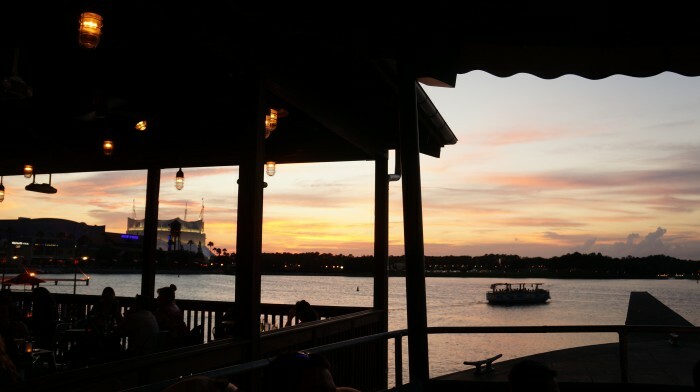 The back porch is a lovely setting with the charming water taxis and intriguing amphibicars gliding over the water and the Characters in Flight balloon rising into the sky. Along the side is the outside bar with seating for about 8-10 people. 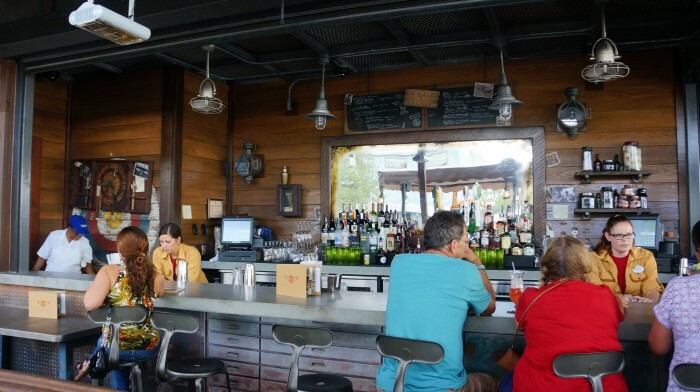 This is another great bar, with a different vibe than the inside bar due its proximity to the hustle and bustle of Disney Springs, and the live entertainment on the nearby plaza stage. On our visit I was initially disappointed to be seated aboard Reggie the boat, not because Reggie didn’t interest me (certainly not!) 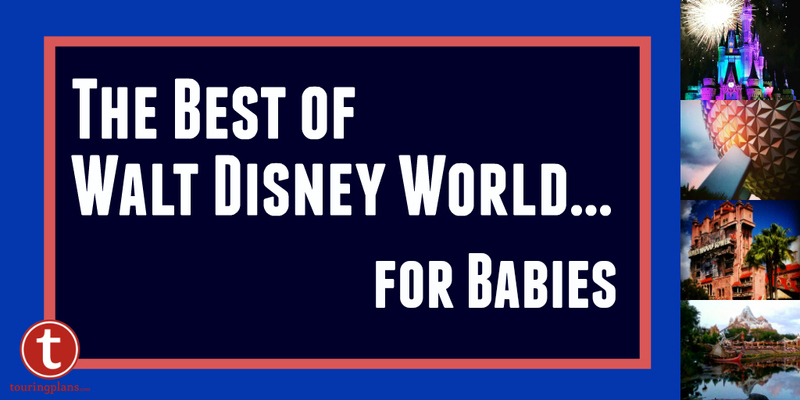 however, for a first visit it can initially feel like you might be missing out on the whole experience, or like they put baby in the corner. However, after a few minutes of getting comfortable with the space, and stealing a chair from a nearby table, I started to get my sea legs and enjoyed being aboard Reggie. With the side-by-side cushion bench seating it felt like being aboard an overgrown Jungle Cruise boat. The tables were way too small for all the sampling we would be doing, but perhaps regular, non-blogging guests won’t need as much space. Reggie is quite the charming area at sunset. On our visit we were treated to a beautiful, pink toned sunset, a great send off to the last day of Summer. 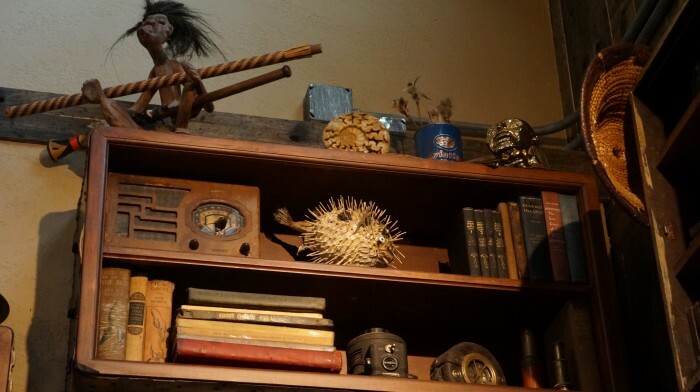 Throughout Jock Lindsey’s Hangar Bar you will find a few examples of how Jock rigged many power sources to bring the Hangar Bar to life. Reggie is no exception as along the stern you will find quite the conspicuous set up acting as the power source. This “ingenious” rigging causes the lights to surge and flicker every so often around the perimeter of Reggie. As archaeology is to Indiana Jones, hoarding collecting is to Jock Lindsey. 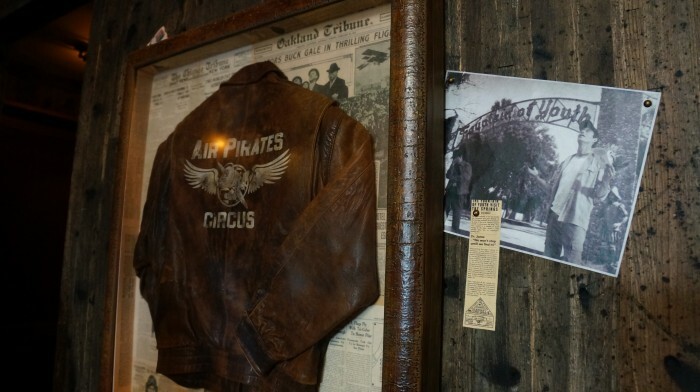 This adventurous, fictional pilot traveled the world not only with Indiana Jones, but many other adventurers. Throughout his travels he collected and curated artifacts, mementos, exotic foods, and cocktails from around the world. 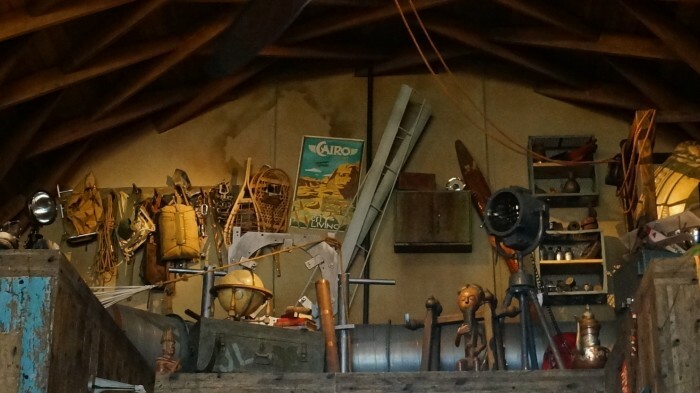 While the many decorations including nostalgic postcards, trophies, and newspaper clippings are made to appear from the 1930s and 1940s, Jock Lindsey’s Hangar Bar is set in modern day. It is storied to have been established during that by-gone area but remains in operation today. 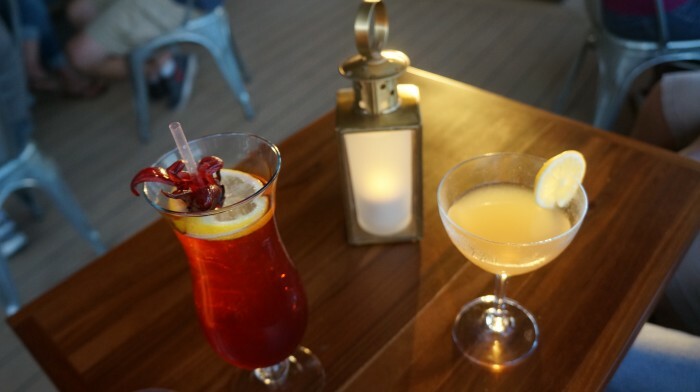 A few drink selections, such as the Wrong Island, and the jazz-tronica music bring the modern day feel. The amount of details in this place is overwhelming and enough to drive me bonkers. There is no way I could photograph it all, much less even half of it, in just one visit. Moreover, I am not an Indiana Jones fanatic so I will readily admit most of the “Easter eggs” were and will be lost on me, sorry to say. But I will do my best to point out the highlights. If you recognize any specific references feel free to let us know about it in the comments. 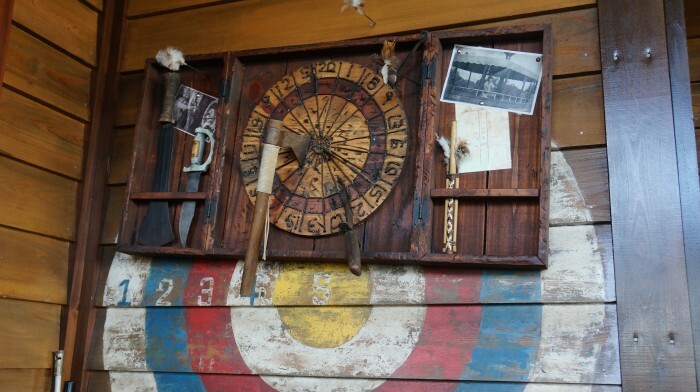 My personal favorite decorations are the black and white photos taken of the Hangar Bar during its “early days of operation”. 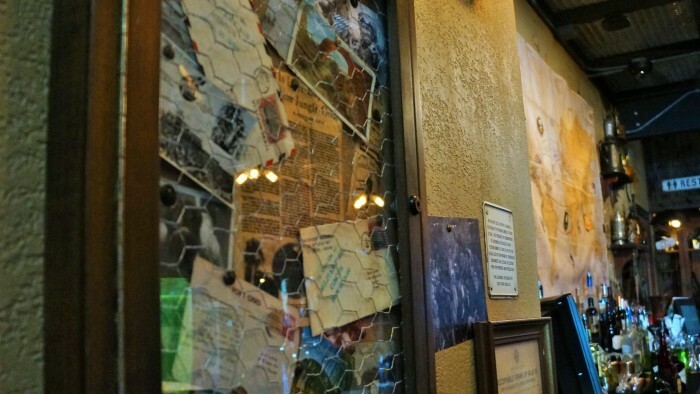 In many of them you can one or a few characters from the beloved and much mourned Adventurers Club. I also love that the outside seating area is full of details as well. The experience is not made any less by sitting outside, I assure you. 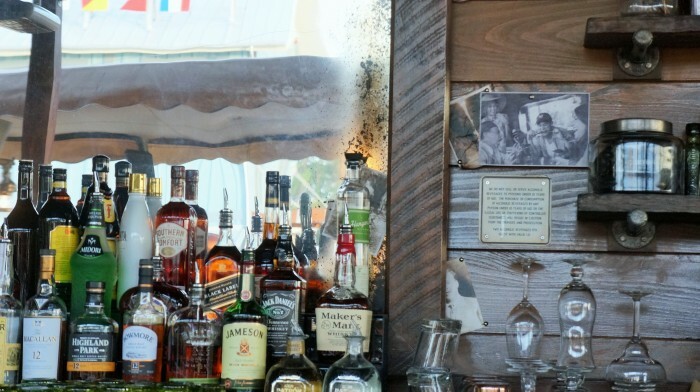 During our first visit my crew and I were able try quite an array of food, and some of the drinks. 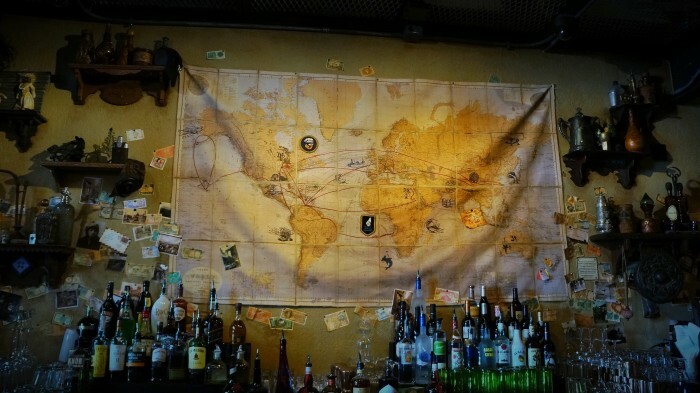 The menu is an interesting collection of tastes from around the world, primarily inspired or curated from the destinations visited in the Indiana Jones movies. 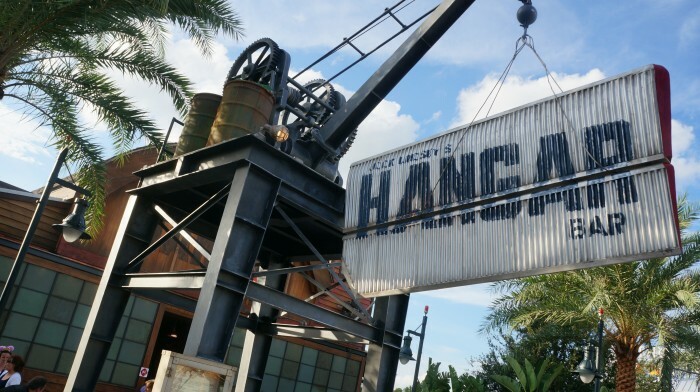 Since the focus of this post is to give an overall first impression of Jock Lindsey’s Hangar Bar, I’d like to share a few brief thoughts about some of the food and drinks we tried. We sampled a variety of food and overall the food was a little dry. Perhaps this is a result of food sitting in “the window” waiting to be delivered to the tables since this was first day of operation. However, we learned that the Cast Members wear pager-like devices that alert them when food is ready to be delivered. The two surprise hits of the evening were the Good Dates ($8.99) and the calamari flatbread ($14.99 — I refuse to call it by its formal, ridiculous name). 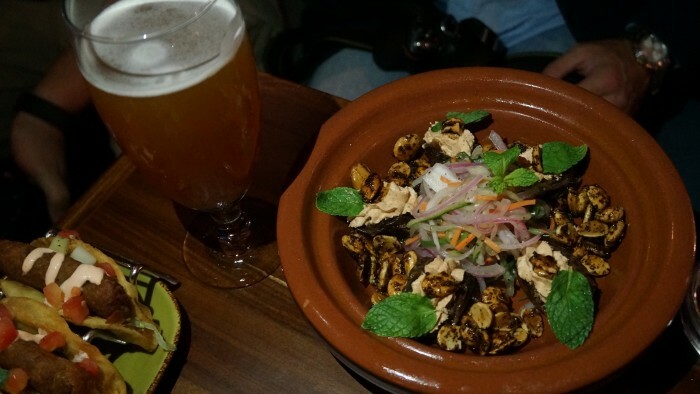 The Good Dates are goat cheese stuffed dates with marcona almonds, these two components are definite standouts, the pickled vegetables that accompany this dish are somewhat unnecessary in my opinion. Most of the fruit juice based cocktails do not pair well with this dish, however the more “straight up” drinks as well as beer and wine (both of which are represented very well on the menu) would taste great alongside this plate. The calamari flatbread is a perfect choice for calamari fans. 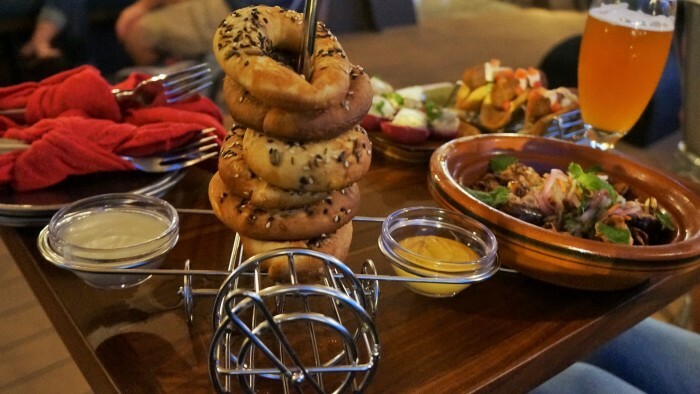 The harissa spread gives a nice Mediterranean flavor. This is a great option to share. The Air Pirate’s Pretzels ($8.99) were also a surprise hit. The caraway seeds add depth to the flavor, the beer cheese is way-too-good , though the mustard may be too strong for some palates. The cocktail menu is very impressive, much more so than the oft compared Trader Sam’s Grog Grotto (in terms of variety). 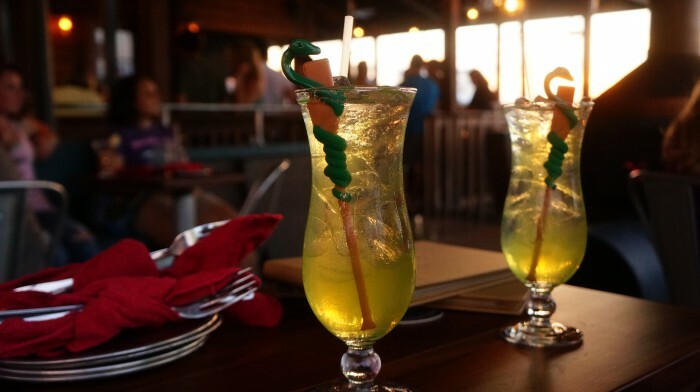 During our first visit our party tried the Scottish Professor ($10.25), Bedtime Story ($11.00), Reggie’s Revenge ($10.25 — without mug), Shorty’s Singapore Sling ($10.25), and the Cool-headed Monkey ($10.25 — without mug). All of these were pretty satisfying. Upon returning I would be most tempted to order the Scottish Professor or the Singapore Sling again. Both tasted more like expertly crafted cocktails when compared to the others we tried. Of course I may have been a little overly excited that a bar at Walt Disney World is finally offering a Singapore Sling, a famously strong drink that goes down easy. At the time of the visit, the souvenir mugs (four choices) were not yet available. I will definitely be back and plan to try more of the drinks and provide a more in-depth review of all the food and drinks available. Squid! Why’d it have to be Squid? I’m curious why you feel the “formal” name is “ridiculous”? Or, more to the point, any more ridiculous than the “official” name of anything else in a restaurant or bar at WDW? Calamari is, after all, just squid. 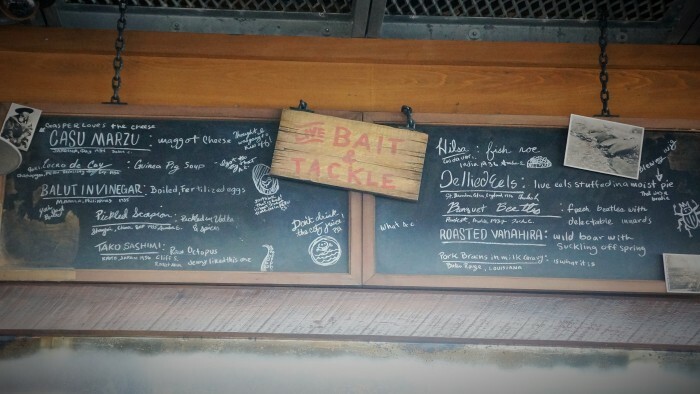 Just as Mahi-Mahi is simply dolphin fish (not the mammal). Interesting, we must have gotten there a little after you, were told it was a 90 minute wait, but immediately were told that we can go inside and grab a drink, which we did. 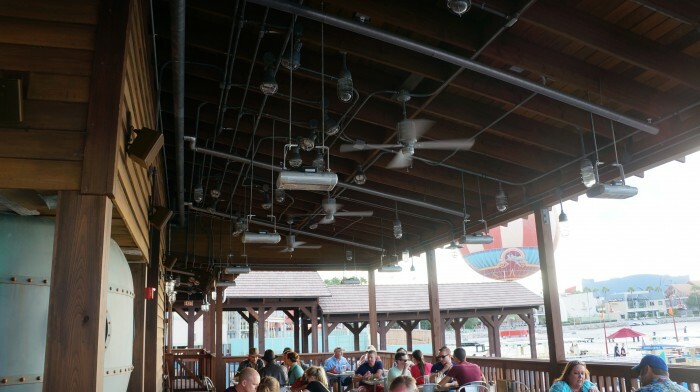 We then meandered to the outside bar and were told that all bar stools as well as the boat outside were first come first serve and they weren’t part of the reserved seating. So after hanging out a bit we were able to grab 4 bar stools outside and cancelled our table that we were waiting for. All the bartenders confirmed this too that we talked to! This is great information, thank you! It is always interesting how operations change back and forth during the first few days / weeks of opening. It would be nice to have a little better description of the drinks, like maybe what is in them, are they strong, fruity, tart, etc… “Both tasted more like expertly crafted cocktails when compared to the others we tried.” doesn’t get me much of a feel for what the drink is. As the previous commenter said how is “Squid! Why’d it have to be Squid?” any more “ridiculous” that the rest? It is part of the theme. When you didn’t mention the name I had to do a Google search to find the menu to look up the name of the flatbread. Thanks for the feedback, Staci. I apologize for the disappointing lack in detail and will do better next time. I would like to note that there will be another post coming in a few weeks that will really delve into the menu detail top to bottom. Thanks! I will for it. I never know which drinks to try. So I’ll ask the inevitable question…could I bring my kids here? I’m talking late afternoonish, not at night. They are older elementary age and have seen all the Raiders films. I am just dying to see this place but don’t want to be “that parent” bringing the kids somewhere they shouldn’t be. Thanks for any insight! 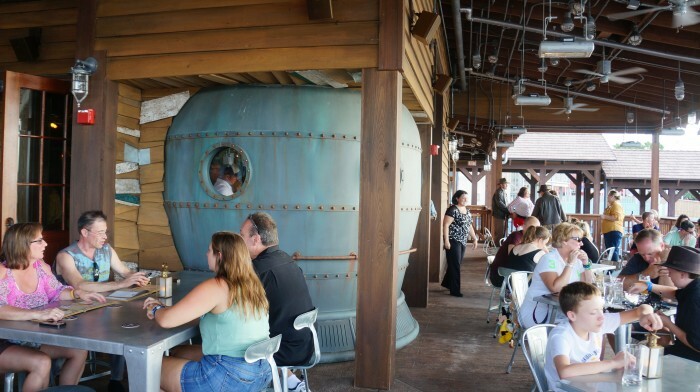 This looks like it will be my new favorite place in all of Disney World.